“Change is the only constant in life." DEA agent Mike Ryan (Daniels) would rather be rock climbing with his buddy and fellow Special Op John Grogan (Craven)...but instead he’s chasing after a gang of Asian drug lords led by the sinister Victor Chow (Tagawa). Like Showdown in Little Tokyo (1991), Tagawa and his boys are going to unleash a powerful new drug on the black market. When Chow murders his buddy, despite being told to just “let it go”, Mike Ryan goes out for revenge - but who can he trust? The beautiful Jade (Nickson)? The beautiful Detective Fong (Cheung)? Mike Ryan is going to have to go rogue and trust his own instincts and martial arts skill on his quest to find Victor Chow. 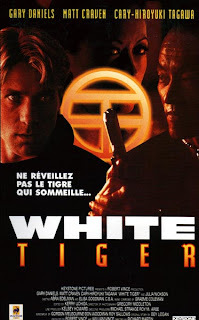 Gary Daniels plays another likable dude and Tagawa another baddie in White Tiger, a film with not much going on in the plot department, but which contains great fights and is very fast paced. The story is credited to Bey Logan, the mastermind of the excellent Dragon Dynasty label of releases. So you know there’s going to be quality fights and stunts. Funnily enough, the music that underpins it all is either this modern techno or 90’s “grunge”. While the movie does take place primarily in Seattle (although it was filmed in Vancouver, Canada), the band “Pull” should be ashamed. Graeme Coleman who did the electronic soundtrack was trying to bring the martial arts film into the 90’s, but we feel he over-reached a bit. But the overall feel is that the filmmakers were trying to modernize the direct-to-video action film, with the aforementioned music, slick cinematography and a professionally-made vibe. Luckily, they didn’t use these things as substitutes for the action goods, as is so common today. Gary Daniels always rocks and here is no exception. In his non-action scenes, he is his usual personable, charming self, and in the action department, he seems to be constantly pushing himself and trying new things. Check out some of his awesome takedowns for proof. 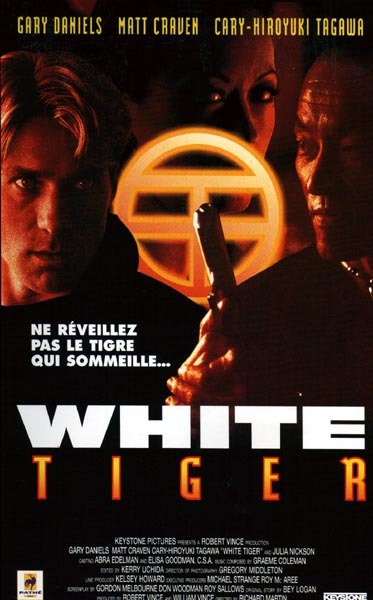 While Tagawa and some of the others are good, White Tiger is a clear case of No Daniels = No Movie. He carries the film and makes it seem effortless. 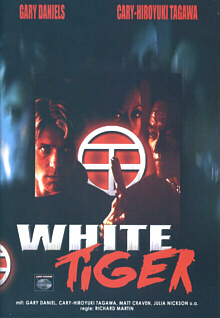 For an intellectually unchallenging but classier-than-usual DTV beat ‘em up, White Tiger will fit the bill perfectly. Need to see this again but from memory this is probably in my Gary Daniels Top 5. I heard Bey Logan didn't really contribute much towards this film. His original script was all but scrapped when funding got cut and they just took the title and Daniels. Still fun, brainless action movie and GD has done a lot worse than this. That is unfortunate about Logan, but thankfully the movie still turned out to be pretty fun! I like that line. I'll do my best not to steal it. Great review! I have this in my queue, I'll have to give it a whirl sometime. Thanks! Looking forward to your take on it. 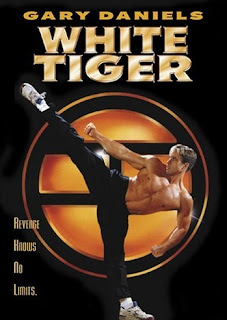 this just climbed up my list because of bey logan and a star from double dragon. Cool. Can't wait to hear your opinion on it! Hey! :) Didn't know where to comment my thanks... so I guess this will do? LOL. Seriously, thanks for appreciating my drawing. Really. :D thanks! I did this one 2 and 1/2 years ago, and I just looked at the review again and saw that I said "wow, this is only our sixth Daniels film, we need to get more of his stuff up here", and now he has 37 tags! Anyway, i think you put this perfectly, that, while they tried to modernize the DTV actioner, nothing they did was a substitute for the quality action we expect. Thanks! We're glad we both agree on this one. What is the name of the "asian"music played during the scene of Gary having sweet moment with the chinese lady? Hmm not sure. Wished we knew also.